At this time last year, Peter and I thought we were doing pretty good with our environmental practices. We were a one-car/one-scooter household, carpooled, used mass transit, recycled, tried to remember to use cloth bags, shared our house with roommates, had a decent sized vegetable garden, etc. We were certainly doing our part. Then we heard Richard Heinberg speak at South High about the interplay of global warming and peak oil and his message hit us like a ton of bricks. That was when we really understood the problem facing all of us. And by understanding that, we also understood how much we needed to do and how quickly we needed to do it. No one has ever had such a profound impact on our lives. Richard Heinberg is a uniquely gifted speaker who can take complex and scary information and make it understandable and manageable. He has just released a new book called The End of Growth in which he explains the effect peak oil (and overall resource depletion), climate instability and debt will have on our economic systems. We hear politicians on the news every day spouting off about how what they are proposing will bring jobs and economic growth. Some of these claims are absolutely baseless — voodoo economics that has been proven not to work for three decades. But even economists who are not driven by a political agenda are heading in the wrong direction, and our news media is going right along with them. It’s understandable. The field of economics itself is only a few hundred years old (if we start with Adam Smith). This was the time of the industrial revolution and then the technological revolution. It was the time of coal and oil and gas. As we move into a new era and come to terms with the “new normal,” basic economic principles may still apply but some of the unquestioned beliefs of economists will have to change. One of these is the concept of an economic system based on growth. That’s the focus of this new book. 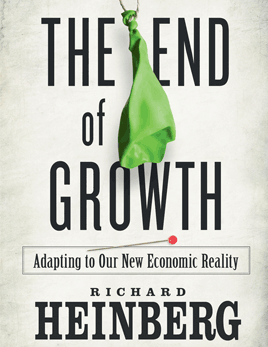 I like the catchy title, but I don’t think we will really have an “end” to growth. Instead, I think we will redefine our concept of growth. There are SO MANY unmet needs right now and SO MANY people who are unemployed or underemployed who could be meeting those needs. There must be a way for us to circumvent the dominant economic system in order to meet those very real needs. That’s why I like this book – it will help us think outside the box. If anyone is interested in reading this with me, I’d like to propose this book for the Longfellow Sustainability book group. Let me know if you’d like to join me. This entry was posted in Transition Info and tagged economic growth, jobs, new economics, the new normal, transition movement. Bookmark the permalink.